Today we feature the latest in our series of people, places and things which make Canada one of the greatest nations in North America. A source of pride for any nation is it’s culinary traditions. The taste buds of the global community have been enriched by Greek Souvlaki, Italian Spaghetti, Indian Masala and American Hot Dogs. These menu items define the nation from which they have emerged and enhance the international standing of their countries. The Canadian contribution to the global kitchen emerged from the opportune partnership of an aging hockey star and a police officer. They would take tepid coffee and fattening food offerings, baked fresh in a central location and transported frozen to locations across this great country and worldwide from Buffalo to Detroit. This is the story of Tim Hortons. Tim Horton was born in Northern Ontario mining country in 1930. The hardscrabble towns of Cochrane and Sudbury offered only a couple of options for a boy growing up in the midst of the Great Depression. Most of his school chums stayed in town, took a job in the mines and become miserable drunks. Unlike most of his peers Tim excelled on the frozen pond and was able to escape the fate of his peers and become a functional alcoholic. 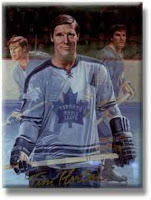 His fame on the ice grew and at the age of 18 Tim signed with the Toronto Maple Leafs. After short stints at minor league affiliates St. Mikes and Pittsburgh, Tim soon became the bedrock of the Maple Leafs backline. At 5’10, Tim towered over the malnourished players in the six team NHL. A serious injury in 1955 made Tim realize that his hockey career could be cut short at any time. This convinced him to parlay his fame into a series of harebrained business ventures to secure his future. A hamburger restaurant failed but would show the way for McDonalds and its founder, future Leaf Lanny McDonald. He opened a Studebaker dealership in 1962 but that was doomed to fail as Studebaker went out of business in 1959. A bar was opened but quickly closed when Tim and his wife drank all the booze. Salvation would be found though in the coffee which the Leafs used to sober up Tim before each game. In 1964 Tim would open up a donut shop in nearby Hamilton. In 1967 he partnered with his best customer, a police officer named Ron Joyce. Together they would expand the chain to 40 stores until tragedy struck on a February morning in 1974. Horton had beaten the odds with a successful hockey and business career. He could not beat severe head trauma caused by flipping his Italian Sports Car. This was done while driving without a seatbelt at 160 km/h, after a game and under the influence of vodka and antidepressants. The tragedy caused pain for many including his business partner Ron Joyce. He fought through the tears to quickly take control of the company with a quick payout to the grieving widow, who like her husband was under the influence of drugs and alcohol. Lori Horton quickly drank through the money and tried to unsuccessfully use the courts to turn back the $1 million dollar deal. Throughout the turmoil the chain quickly expanded and destroyed the competition like an éclair fuelled Wal-Mart. To quell a mutiny in Afghanistan the Canadian Army opened up an outlet in Kandahar. A politician must prove to Canadians they love their “Timmys” and cannot survive if it is suspected he is a Starbucks drinker. A person can lose their job if they bring their boss a Country Style Coffee. Every year manicurists are filled with millions who have damaged nail "Rolling Up the Rim" to win a free cruller. Even the term “double double” has entered the Canadian lexicon to define brown water flavoured with 2 creams and 2 sugars. Though the company was acquired by Americans and later spun off it still retains the down home charm acquired by its association to a long dead drunk driving Canadian Hero. Luckily a drunk driver doesn’t have to go far as there seems to be a Tim Hortons on every block. 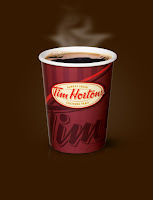 This makes Tim Hortons….A Canadian Icon!